One of the best-kept secrets about our Lirios Design development is undoubtedly Villa Siros XL. Its two floors, with an exceptional design, overlook the tranquil Cumbre del Sol Residential Resort in Benitachell. The layout of Villa Siros XL has its roots in one of the Costa Blanca’s most valuable treasures: the sun. Thanks to its large windows, this villa takes advantage of the hours of sunlight all year long. In fact, two of the most important rooms, the living room and kitchen, open onto the terrace via two large picture windows. As a result, Villa Siros XL allows us to enjoy the landscapes on every one of the Mediterranean’s 365 sunny days. There’s also the infinity pool, whose blue water appears to merge with that of the sea. And after your swim? The Mediterranean terrace and garden provide a unique space in which to relax however we want or need to. The comfort provided by Villa Siros XL begins as soon as we arrive at the house. The home is accessed via a porch which is connected to the parking area. The main floor then awaits us with its kitchen, spacious living room, two bedrooms with a shared bathroom, and master bedroom. As we mentioned before, two large windows allow light into the living room and master bedroom, the sunlight flooding this main floor. Villa Siros XL is found in the Lirios Design residential area, located in the Cumbre del Sol Residential Resort. Each home stands alone and offers its own parking area, private pool, plot with boundary walls, and garden. In addition, the Cumbre del Sol Residential Resort provides all the services you need to make Villa Siros XL your home. A supermarket, a hair salon, a pharmacy, bars, restaurants, the international Lady Elizabeth Junior School… not to mention the sporting options! Tennis courts, padel courts, hiking routes, a horse riding centre, and great conditions for cycling. If you need to disconnect, what about visiting the coves found close to Cumbre del Sol? Or, how about enjoying a day on the beach before a swim in Villa Siros XL’s infinity pool? If you feel like exploring, there are also the municipalities close to Cumbre del Sol, such as Benitachell, Jávea, Moraira, and Altea. 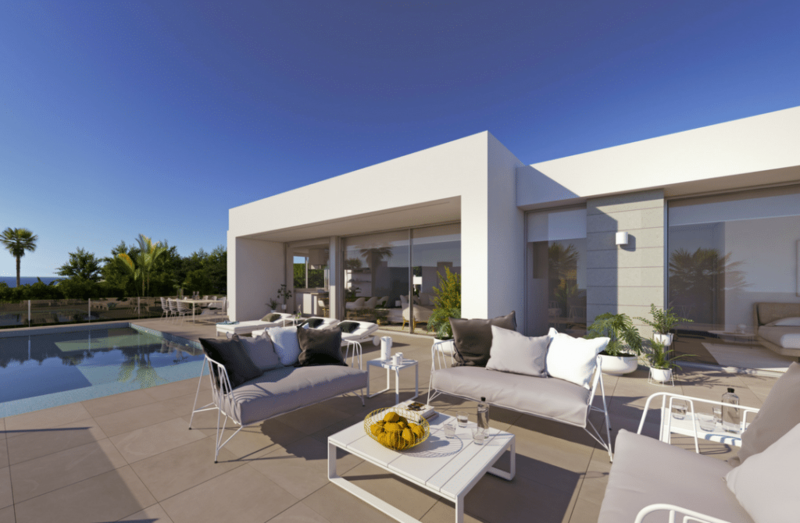 If you think that Villa Siros XL could be the perfect house for you to begin your life in this paradise location on the Costa Blanca, fill in our contact form and we’ll provide you with more information about one of our most exclusive villas.